There was a bar backstage which we crowded into after the show, sharing a few drinks where Bowie, Led Zeppelin, Kraftwerk, Judy Garland and many other famous and talented people had gone before us. It was a bit surreal. I had been in Paris before, almost ten years before actually. I was backpacking through Europe with a friend after college. We took care of many of the touristy things, a day at the Louvre, the Musée d’Orsay, Champs-Elysées, L’Arc de Triumphe, Notre Dame, The Eiffel Tower, Versailles…all that jazz. I didn’t really have a plan for Paris this time around, which is not like me. 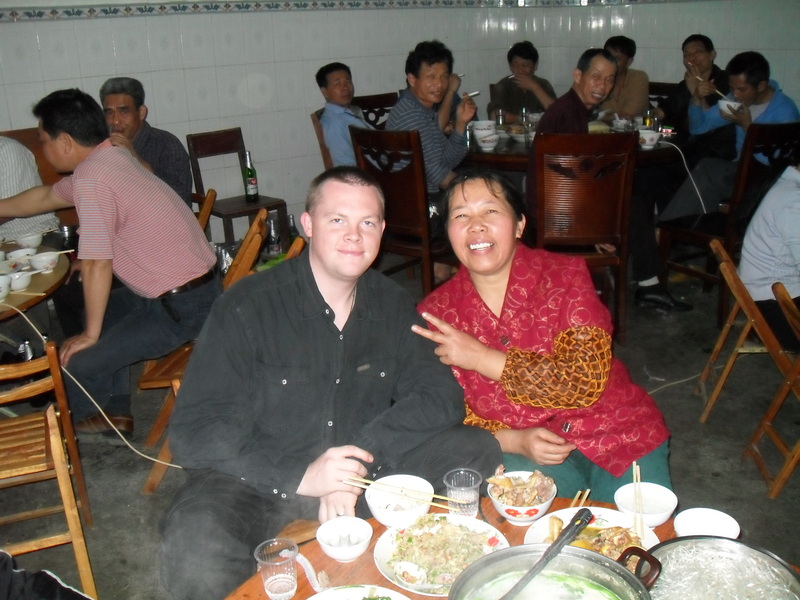 I had become the de facto tour guide in China because I wanted to maximize any free time I had. But when I got to Paris I was like, eh, I think I’ll just walk around, maybe eat some cheese, maybe drink some wine. One of the many wonderful things about Paris is that it’s so walkable because of its size and because there’s always something beautiful to look at. It’s an incredibly photogenic city. So I basically spent a few days dividing my time between two activities – walking and eating, and hoping the former would counteract the latter. My favorite places to do both of those were the Latin Quarter and Montmartre. I know they’re cliche, but they’re cliche for a reason. I don’t have much else to say about my time in Paris other than it was lovely and leisurely. I will let some photos do the talking. I was going to try to smuggle some unpasteurized goat cheese out of the country but it was eaten within a matter of hours. I was in Las Vegas a few weeks ago for a dear friend’s bachelorette party. We found they take that “What Happens in Vegas, Stays in Vegas” promise quite seriously. While at the “club pool” at Caesar’s Palace, where we were staying, one of the girls with us took a photo. Security immediately rushed over and erased it. At first we were confused but it didn’t take us long to figure out why they wouldn’t want the world to see what goes on there. Meanwhile, I got a snap in unnoticed. The Pee Pool, as we would later refer to it. And soon you will know why. We flew in at night. After you pass the Rockies it’s a virtual sea of black till – BAM – Vegas appears sparkling on the shores of the desert. I have been to Vegas twice now and its preposterous geographic location is just one of the reasons I feel kind of weird when I’m there. Reason #2 is that, to me, it is a symbol of many things I don’t like about the world, and reason #3 is that 5 minutes after I get there I start to like those things. Ok, not those things, but I start to do things I wouldn’t normally do, like pay $20 for a 32oz bloody mary at 10 in the morning (sidebar: not advised in 108F heat), or buy gelato for $17.80 at 1am, or stand in a pool with 200 half-naked strangers who are most likely peeing in said pool because you have resorted to peeing in the pool because the bathroom is so far away and everyone around you has told you they are peeing in the pool, or eat truffled potato chips covered in blue cheese (ok, I probably would do that at home). Wolfgang Puck, you are an evil genius. Luckily, I was in good company and we genuinely had a great time doing things we weren’t ashamed of as well. One of those things was renting a pontoon boat on Lake Mead for a day. Folks, if you are going to Las Vegas, are over the age of 25, and do not have a gambling problem, do yourself a favor and do this too. It was beautiful and relaxing. I was not even aware that it was nearby, but luckily for us, the bride’s sister had it arranged before we got there. Lake Mead is only 45 minutes from Las Vegas, and you can stop by the Trader Joe’s off of 515 to stock up on snacks and La Playas. It was the perfect balance to the frenetic energy of Las Vegas. Plus, I found it to be quite affordable when you have a few people to share the cost. We spent the better part of the day floating around under a bright blue sky, surrounded by mountains and we could pee in it all we wanted and not feel gross. I came back actually feeling rested, which I wasn’t expecting from a long weekend in Vegas. Who knows what ridiculous things I would have done/bought/consumed if I were on the strip that day. So for anyone planning a trip, I highly suggest spending a day on Lake Mead. You won’t hate yourself in the morning. It should be no surprise to anyone who knows me that I ate my way through China. Before I left, I had heard from many people that I should be prepared for some of the food to make me sick and that under no circumstances should I eat street food. “But,” I thought, “Anthony Bourdain and Andrew Zimmern are always eating street food and they love it.” And after 6 weeks of eating on the street and never having gotten sick (perhaps I should wait for the blood tests to get back before I swear by that…) I must say I’m happy that I listened to the strangers on TV rather than the perfectly reasonable people I know in real life. One of the suggestions I had received was to only eat in hotels. We had catering provided in almost all the hotels we stayed in. Some of it was good but a lot of it was mediocre, like a whited-down version of Chinese food. The other issue with the catering was that to rely on it meant I would nearly be chained to the hotel and I was more interested in exploring these new places. I can see how one would be turned off by some of the street food at first. I was lucky enough to have a Mandarin speaker there to translate much of the time which made me more confident that I wasn’t going to end up with dog on my plate. Speaking of dog, the good (or possibly bad) thing about dog meat in China is that they see nothing wrong with eating it so they don’t try to hide it. The reason I even bring up the issue of dog meat is that when people warned me about street food in China, one of their main concerns was that I would somehow accidentally eat some. Honestly, I didn’t come across it often and found it easy to avoid. I understand there is some hypocrisy in finding one kind of meat revolting and another kind finger-licking good but for me, there is a difference. People have personal connections with dogs that they don’t have with other animals. A dog will excitedly greet you at the door, affectionately rest its head on your lap and even loyally stay by your side when it knows you are sick. I’ve just never seen a chicken do any of those things. I would hate for any of the fears that were expressed to me to keep people from being adventurous with the food they try. I had so many delicious things. The inexpensiveness of it made it easy to sample many different dishes and fill up on local specialties for a couple dollars a day. One meal in particular, in Nanning, where 10 of us each had noodle soup and split vegetable dumplings, came to 27 yuan, that’s…are you sitting down?….about $4. For 10 people. FOUR DOLLARS! Like I said, dog meat was easy to avoid and there is one simple, sure-fire way to avoid it: learn how to say that you don’t want it. I’m a big believer in trying to learn a few important words and phrases in the language of the country in which I’m traveling, even if that language is as difficult as Mandarin. These days, there are enough resources, including free ones on the internet, that it is an easy thing to do. Learning phrases like, “Hello”, “Thank you”, “You’re welcome”, “Excuse me”, and “Do you speak English?” can make a world of difference in your tarvel experience. That being said, for the first two weeks I had the phrases for “Excuse me” and “You’re welcome” confused. In my defense, they sound kind of similar. But that meant that for a couple weeks I was bumping into people and following it up with, “You’re welcome!” I’m sure that did not do much for the American image abroad. Besides those basic phrases, there was one that I made sure to have in my arsenal, “I don’t want dog meat.” or in Mandarin, “Wo bu yao guo rou.” You can even hear the tones here. I also made sure to learn the “dog” character, 狗, so I could identify it on menus. It’s that easy, folks. In every city we were in, it was easy to find markets or single vendors selling dumplings (I think I consumed about 873 dumplings in 6 weeks, all of them delicious), sticky buns, roasted chestnuts, soup, roasted sweet potatoes, grilled meat, fish and bread… The mantra became the dirtier the better. 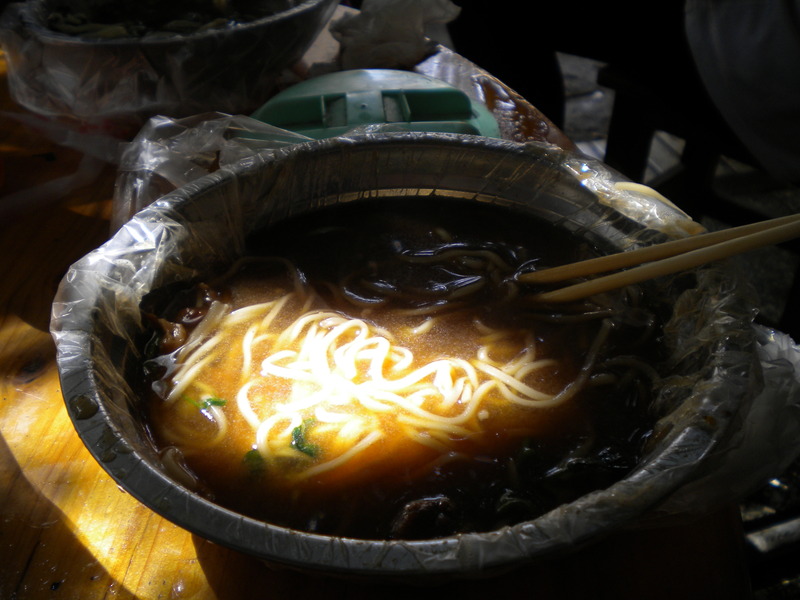 I remember one specific time in Wenzhou when some of us hopped on a bike taxi and asked our driver to take us to some street food. Instead he took us to a restaurant where we could see tablecloths through the window. “Tablecloths? !” we said, “What kind of people do you take us for? !” Instead, we found a restaurant across the street that was much more our style, that is to say, dirty. We actually sat next to the fish that was about to become our stew. We had the most delicious sweet and sour pork, like nothing I have ever had stateside and a steak dish with ginger, soy, cilantro and spring onions that I have desperately been trying to recreate since I’ve been home. Afterward, one of the dancers and I got $1 manicures. A prostitute came in to the salon to use some make-up and told me I had a beautiful nose. So all-in-all, it rounded out to be a lovely evening. Lisa sitting next to Splashy, whose number was up. The thing is, I never get Chinese food at home. I find it heavy and greasy. I found the food in China to be much different, lighter and fresher. I was often wathcing them make it right in front of me. 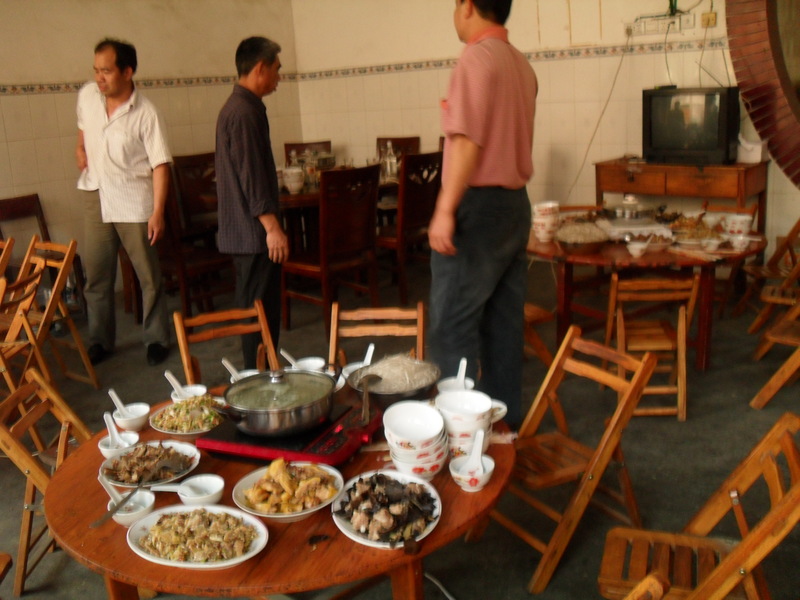 A great example of that was a Uighur restaurant we found in Foshan. Uighurs are a Turkic people from the Xinjiang province of northwestern China. They are Muslim so their food is halal. They are known for their lamb kabobs and homemade noodles. I was able to watch the amazing process of making the noodles and I have a video here. The noodles were so tender and soaked up the delicious sauce they sat in. We tried a few different dishes but I really loved a very simple dish of noodles with eggplant, green beans and a light sauce heavily flavored with cumin. We loved it so much went back to the restaurant the next night and they didn’t even serve alcohol which is SAYING SOMETHING for his group. If you are traveling in China I would highly recommend trying some of the Uighur cuisine. I could honestly go on and on about different dishes and meals I had while in China. I tend to be a bit evangelistic about food in general but I was particularly happy, and honestly, surprised at how much I liked nearly everything I had. There is one thing I can not leave out, though, and that is The Most Delicious Banana In The World. I know that food tastes best when it’s perfectly ripened and picked fresh. I’ve tasted it for myself. Being that bananas are grown in the tropics and shipped long distances to us in the states, we probably don’t even know what a really good banana tastes like. I certainly didn’t till I had one in China. We were touring some gardens in Foshan and one of the girls spotted a cluster of bananas. She climbed up the tree and threw a few down. Sweet mother of baby Jesus in the manger they were delicious. They were so….banana-y. I never suspected bananas had so much flavor. Every person that took a bite had the same initial blasé response (How good could it be? It’s a banana.) which turned into wonder and amazement. Every banana I’ve had since has just been a disappointment. So the moral of the story is, if you see a banana tree, grab yourself a banana and enjoy. And if you’re traveling in another country, or anywhere, or heck, even in your hometown, be adventurous with what you eat. You might just find The Most Delicious Something of your own. Or you might get a tapeworm. Beijing was the last stop on tour and I had been looking forward to it since I learned I was going to China. First of all, it’s Beifreakingjing….the Great Wall, the Forbidden City, Tiananmen Square, the Hutong neighborhoods…. In addition to that, I had the ridiculous luck of being able to catch up with some old friends there. “In a classic example of bad planning” as Time Out Beijing put it, Riverdance was in Beijing at the very same time we were. I had some friends who were on the tour, including my dear friend, Aislinn, from New Zealand. We hadn’t seen each other in almost four years. When you have a friend who lives as far away as New Zealand you basically resign yourself to hardly ever seeing them. But, as the fates would have it we ended up in Beijing at the same time. Unfortunately, the Riverdance kids were shooting a DVD. Well, that part was not unfortunate but the 14 hour workdays they had made it hard to find time to catch up. We arrived at our hotel in Beijing quite late because of a delayed flight to find that there was no internet. I was trying to meet up with the Riverdance crew but all I had to go one was an email from the day before saying they might be at an Irish Bar (of course) that night. We decided to chance it so we threw our stuff down and headed to the bar. When we got there, I didn’t see any of my friends. Then I spotted someone I recognized from friends’ facebook photos. I figured he was my best bet for contacting them so I proceeded to introduce myself in a super creepy way. We laughed about it later but seriously, who does that? Someone who’s desperate to see their friends, I guess. It worked to our advantage that it wasn’t a big night anyway because the next day a group of us woke up at the crack of dawn (8!) to do a 7 mile hike of the Great Wall. Luckily, I was still able to squeeze in a couple nights with them. But enough about me, let’s talk about Beijing. I didn’t have nearly as much time as I would have liked to explore Beijing but I still found it to be a really, really cool city. Lindsey, the aforementioned tour manager/translator, lived there for 4 years and took us to some great restaurants, neighborhoods and markets. The evening after we hiked the Great Wall, she took us to Rumi, a Persian restaurant in the Chaoyang district. As much as I loved the Chinese food I’d been having, it was nice to be in a city with something besides Chinese food, Mc Donalds and KFC. Rumi totally hit the spot. We all went overboard ordering stews, kabobs, salads, hummus, FETA CHEESE! It was more than we were used to spending on a meal, way more. My 80 RMB bill came with some sticker shock. I had been used to 10 here for dumplings, 10 there for some grilled meat. But 80 RMB is about 12 dollars and 12 dollars for a fantastic meal in one of the world’s capital cities is not bad. 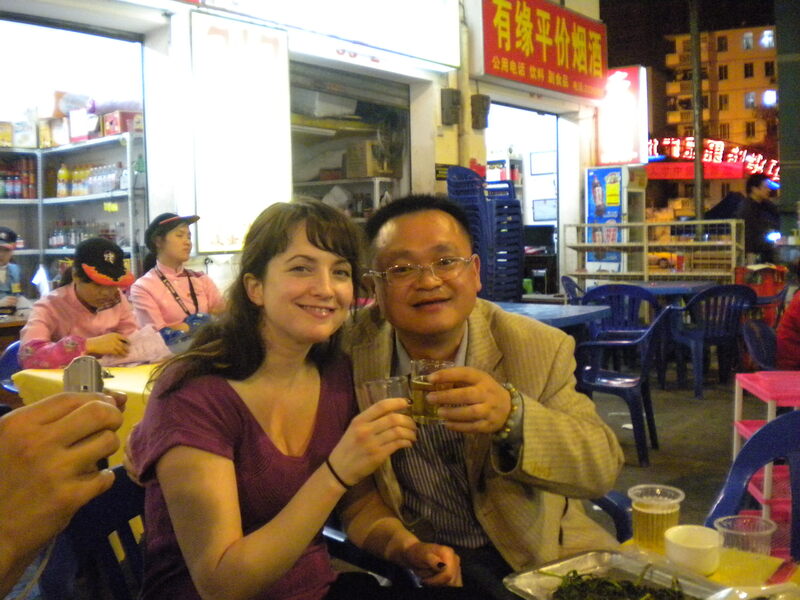 The next day I went with some folks to investigate the San Li Tun market. We had to be at the theater for soundcheck at 2 so time was limited. This is going to sound extremely shallow, but the thing I regret most about my time in Beijing is that I didn’t get more time to shop. I would have liked a solid day to spend in the markets. My goodness, the DEALS you could get and after five weeks, I was a well seasoned haggler. They obviously inflate the prices to fit this game, and do so even more for whiteys. This is one of the reasons you need a whole day to shop. The haggling process can take a while. Let me share with you what I found to be the key to haggling well – The Walkaway. They will start high, then you go ridiculously low. You both creep towards to middle and if you get to the absolute highest price you will accept and they deny you, walk away. Most of the time, they will follow you and give it to you for that price. This is key. If you sit there and continually argue with them, they won’t take you as seriously. I can’t tell you how many times I heard Americans get more and more heated about a price without doing The Walkaway. One man I heard was so mad that he stormed off, the shop worker waited a beat and tried to catch up with him to give it to him for his asking price but he’d already made it out the door. He inadvertantly did The Walkaway and didn’t even know it. After the show that night, we went to see some of Lindsey’s friends play at Mao Livehouse, a cool, laid back bar in the Gu Lou neighborhood. One our way to the show we spotted a Mexican restaurant, Amigo. Upon further examination, it looked like proper Mexican food, corn tortillas, fajitas, chilaquiles, MORE CHEESE, and a 15 yuan special on Mojitos we couldn’t pass up. I must admit, I didn’t eat a whole lot of Chinese food in Beijing. I very much welcomed the variety of options. Plus, I was nursing a serious dairy deficiency that needed to be filled. The next day I was able to meet up with another old friend of mine from my grade school days, Wes Smith, his wife Kasha and their adorable baby daughter, Berkley. But not after some difficulty. We picked a subway station to meet outside of, a very specific one, the A exit of a certain line. Unbeknownst to us there were two A exits. How does that make sense? So after 30 minutes of waiting, I decided I had to find a way to call him. I stopped someone walking out of the station with, “Ni hao….um…can I use your phone?” with the thumb-pinky phone thingy at my ear. The first person I stopped actually let me. It turned out Wes was inside the station looking for me. Easy fix! Except that when I went in, he wasn’t there. And when I came back outside, he wasn’t there either. Again, I stopped someone else to use their phone and not only was he obliging, he waited around while I tried to get ahold of him again which took a few calls. It left me thinking, if a Chinese tourist was in the same predicament as myself, standing outside a subway station in New York saying, “Hello!” then whatever “Can I use your phone?” is in Mandarin with the phone gesture thing at their head, would anyone actually stop? After all that rigamaroll, we finally met up and went for a nice lunch at a Buddhist restaurant near the Lama Temple. Wes and Kasha seem to really love Beijing. Kasha teaches at an international school and while Wes was working and is thinking of going into teaching himself, right now he’s able to stay at home with Berkley. The cost of living there has afforded them the opportunity for one of them to stay home and also to have inexpensive care for Berkley when they need it. Afterwards we walked around the Guanshuyuan Hutong. Hutongs are older neighborhoods in Beijing connected by narrow lanes and alley ways. Many of the homes are in the courtyard style with four buildings built around a courtyard. Some buildings still lack modern amenities, including bathrooms. There are communal bathrooms instead. Since the Cultural Revolution, many hutongs have been destroyed in favor of wider lanes and more modern apartment buildings. But some still remain and are actually protected. The next day, our last day in Beijing, my band mate Eamonn and I visited the Forbidden City and Tiananmen Square. Like many uber-touristy sites, we found the headphone tour to be the best bet. Because we are total cheapskates, we just bought one and shared it. I listened and relayed the info to Eamonn. The Forbidden City is named as such because for nearly 500 years, from the Ming Dynasty to the Qing Dynasty, it was, well, forbidden. It is a palace complex that was home to the emperor, his family and servants (who were mostly eunuchs so they wouldn’t touch the ladies, ouch!). 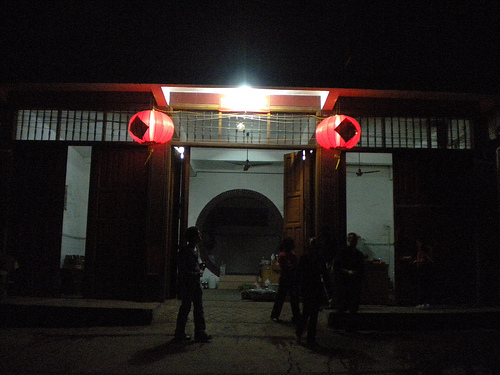 It was the seat of government in China and also a place for ceremonies. I can only imagine the emperors are rolling in their graves right now. I will direct you to Wikipedia if you would like to know more. Here are some photos snapped that day. Later we met up with another friend of mine from high school, Jason Fetz, and his girlfriend, Laura, who are both teaching English in Changchun, which is about a 6 hour train ride north east of Beijing. They just happen to have been flying out of Beijing to Thailand the next day. Coincidence? Probably. But still, a pretty cool one. We went for Peking Duck, seeing as we were in Peking, and let me tell you, crispy duck dipped in sugar may sound gross but it is fabulously delicious. That night Jason, Laura, Wes and Kasha were all able to make it to the show. 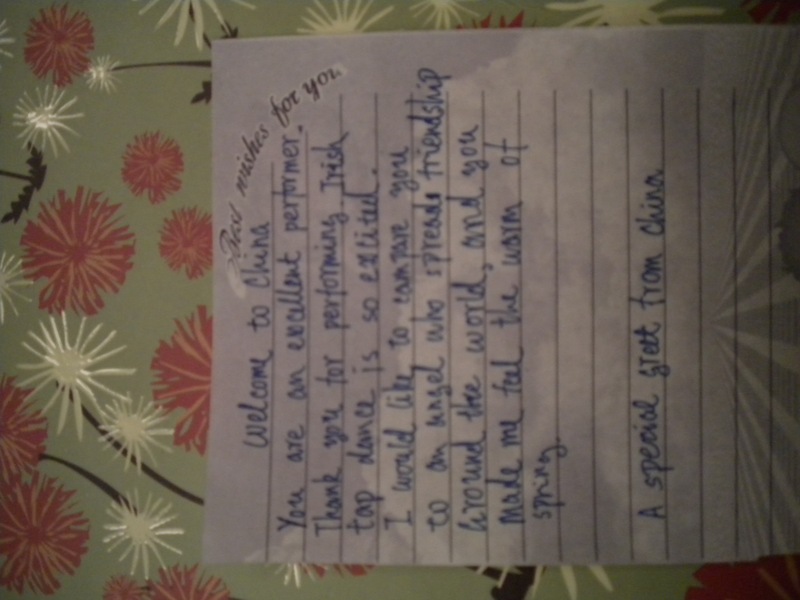 I must say it was pretty surreal and very special to have old friends see me perform in Beijing. Oh and remember how I told you Chinese audiences are rather restrained? Well, I found the one thing that makes them break into raucous applause, the Beijing Olympics Song, especially when I sang the verse in Mandarin. By the way, doesn’t it sound like Sarah Brightman is doing an over-the-top impression of herself? I mean, I thought I had a good Sarah Brightman impression but Sarah Brightman has outdone me. I’m going to have to work on that. But I digress… The song was put in the encore in Beijing as a special touch. Holy crap. They went nuts. I’ve never been in front of people who were more excited to hear me sing something. I even laughed into the microphone the first time we did it because I was so taken aback. It’s hard to take it personally, though, as the cheers seemed more for the song than anything else. So the performances in Beijing ended on a very high note, with old friends there and an exuberant audience. That night we wrapped things up at the Irish bar (of course) to celebrate the last night of the tour, as well as a few birthdays. Jason and Laura celebrated with us. Jason recounts the night’s events here in a much funnier way than I ever could. I hope I’m lucky enough to have the opportunity to go back to Beijing. I would love to go when the weather is warm and spend more time exploring the city without any (or many) obligations. I would be willing to travel in someone’s suitcase. I will pay the overweight fee, or lose 80 pounds, which ever makes more sense at the time. Contact me directly if you think this sounds like something you’d be interested in. We only had one day off in Beijing and I was determined to use it to see The Great Wall. The most popular spot to visit the wall near Beijing is Badaling. After hearing about it from some of the troupe who had been there before, namely that there are American fast food chains there, I decided I wasn’t interested. I didn’t want to risk seeing the Golden Arches or Colonel Sanders while taking in one of the great wonders of the world. Also, I wanted to be able to hike from one point to another as opposed to having one spot to wander around. 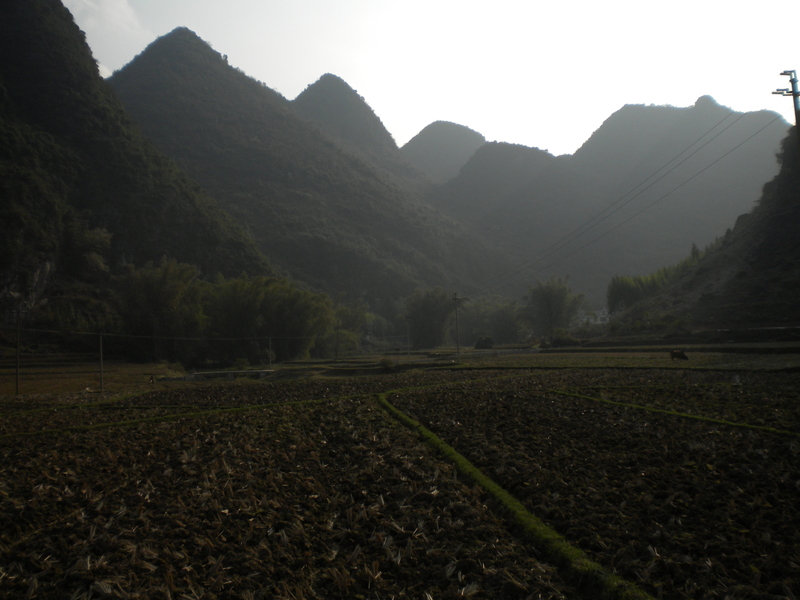 After a little more research, I found a 7 mile hike between Jinshanling and Simitai. I read that the hike would take 4 hours because there are many ridiculously steep steps to traverse. This was just what I was looking for. I wanted it to be long. I wanted it to hurt. I wanted it to be seared into my brain so deeply that even when I’m 85 and senile and talking to lampshades, I’ll be talking to them about this awesome day when I hiked the Great Wall. The problem, I thought, was going to be convincing other people to do this with me. It was early February and hovering around freezing in Beijing. I could understand why people wouldn’t want to venture out for that long in that kind of weather. But luckily 7 others decided to join me in the end. I believe there are busses that will take you to those destinations, though perhaps only during the warmer months, but we were having a hard time finding them. With so little time to plan (we got in at about 10 the night before and headed straight to an Irish Bar (quelle suprise) to meet some cast members of Riverdance (no, there was not a dance-off)), we decided to give in a hire a couple taxis. Taxis are extremely cheap in China, even in cities like Shanghai and Beijing. If you are short on time and have a few people with you, it’s not a bad option. It was two hours there and back, and I believe it was about 800 or 900 RMB which it about 120 dollars, divided by four that’s $30 a piece to get to and from the Great Wall. Not bad. 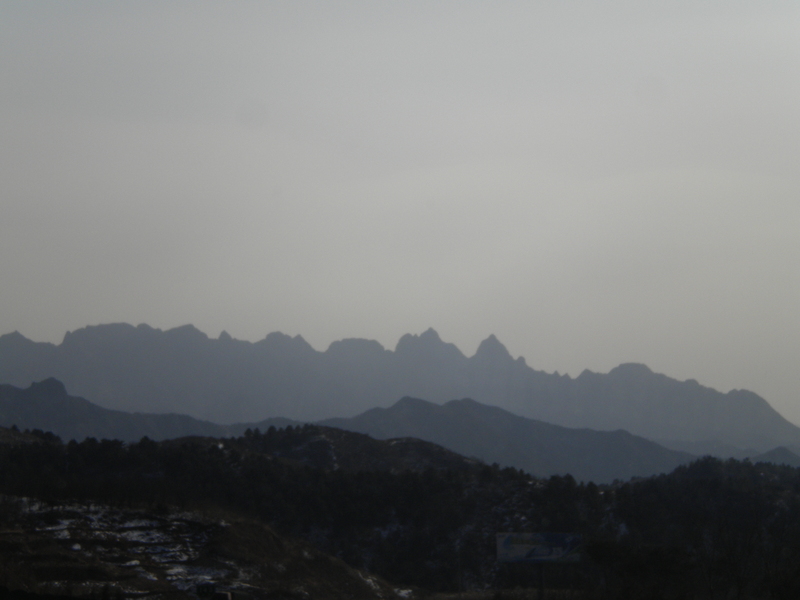 The landscape became more and more mountainous as we drove further north from Beijing. After a couple hours I was scanning the horizon for a glimpse of the wall. At first glance, it looked treacherous, like perhaps-we-made-a-mistake-and-we-should-just-take-a-few-photos-and-turn-back treacherous. I was beginning to fear a mutiny but I learned quickly that it was not part of our hike. Not part of our hike. Phew! After being dropped off we quickly made our way to the wall. We had gotten kind of a late start (remember the Irish bar from the last night?) and we figured the sun was going to set around 6, leaving us about 5 hours. We couldn’t have asked for a better day considering the time of year. It was about 40 degrees and there wasn’t a cloud in the sky. As we were walking through the park to the wall, we noticed some other people had joined us. A woman came up to me, speaking very good English, explaining that they were local farmers. Her name was Shirley. 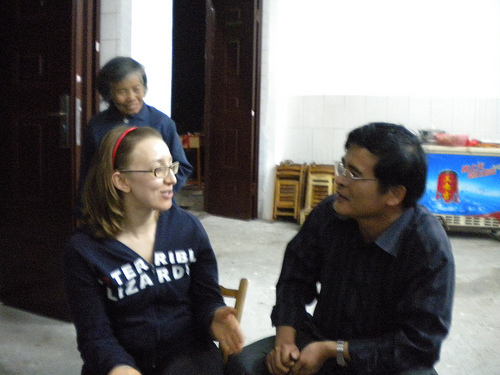 She explained that they were going to join us on our hike of the Great Wall, that they were going to “help” us. “Help us what?”, I asked. “Help you climb!” Hmmmm…I was not interested in anyone helping me climb but I thought they wouldn’t be with us for long. How naive of me. It just so happened there was one farmer for every one of us. Coincidence? Of course not. As they assisted us up particularly steep paths and offered to take photos of us, they were also attempting to endear themselves to us. Shirley kept saying, “You’re so nice! I’m so glad I’m your farmer! Can I take your photo? So pretty! You know, my corn crop was very bad this year…..” You get the idea. About 20 minutes in we were trying to hatch a plan on how to lose them. One of the dancers, Nessa, whose farmer seemed to be the oldest there, decided she was going to try to make a run for it. Oh, silly tourist…these people have obviously been doing this their whole lives giving them freakishly strong legs such that, even at 70 years old, Irish dancers can’t out run them. After the failed getaway attempt, I asked Shirley how long, exactly, they were planning on helping us. “The whole way!” she replied. At this point it had become clear that the only way to gain our freedom was to buy it. Oh yes, I have failed to mention till now that they just happened to be carrying huge bags full of souvenirs. I gathered the troops and explained that unless we bought their crap, they were going to be attached to us for the next 4 hours. Everyone agreed to buy something so we engaged in the customary haggling process, bought some souvenirs and left the farmers behind. I am now proud owner of a “I climbed the Great Wall” t-shirt. After we left the farmers, we didn’t see a soul till we got to Simitai. We had the wall to ourselves. It was almost surreal. If you’re ever thinking of visiting the Great Wall I would highly recommend this hike. There are passages that are incredibly steep that will leave you huffing and puffing and your thighs burning but they aren’t impossible. While it was difficult, someone who is reasonably in shape could do. There are patches in the middle that haven’t been well kept up but there was nothing that seemed dangerous. As I was walking, I would force myself to stop and try to be very conscious of what I was doing. “You’re on the Great frigging Wall of China. Take this in!” It’s like I was afraid I wouldn’t fully realize the beauty and grandeur around me and I’m not sure one can, though there is probably a permanently, fully-conscious Buddhist monk out there who would disagree with me. But it was beautiful and it was grand and it did hurt and I will always remember it and the lovely people I was able to share it with, even Shirley. We had a few days off in Nanning and I was determined to get out of town. I used the Lonely Planet China book to find an excursion. 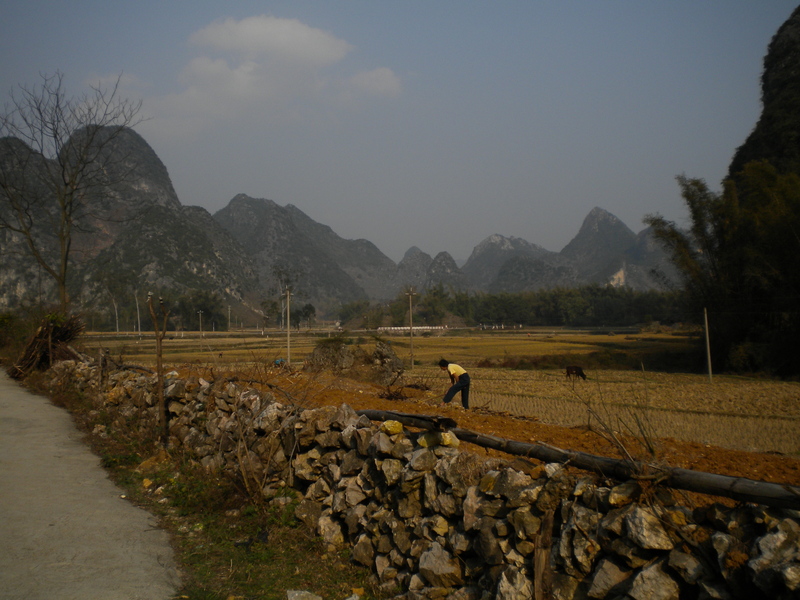 Originally, I wanted to get to this town in the north of the Guangxi province, which we were in, and visit the Dong people. 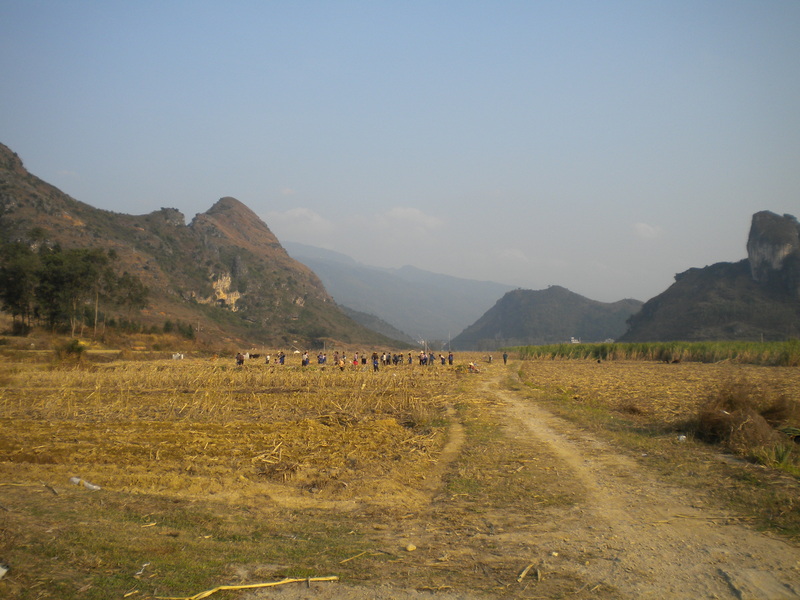 The Dong are an ethnic minority in the south of China whose language is sung. That’s right, sung. How f@£%ing cool is that??! Plus, they built a bridge called the “Wind and Rain Bridge” that was built by hand with no nails. It’s a UNESCO heritage site to boot. But after investigating how to get there with Lindsey, it turned out to be too far away. So we settled for a mountain hike about two hours away instead. I was eager to spend the night outside of the city but few people seemed keen on it. In the end just three of us, Lindsey, Eamonn and myself decided to go overnight and a few others were going to meet us the next day. We were told that there was a bus that went directly from Nanning to the mountain we wanted to hike up (the name escapes me…) every fifteen minutes from the bus station. That sounded easy enough. Except it was completely false. As soon as we tried to buy our bus tickets I knew this was not going to go as planned. The woman selling tickets was so obviously annoyed with us that no language barrier could disguise it. The thing is, we were conducting this in Mandarin. It’s not like she was annoyed that we were like, “WE NEED TICKET. FOR HERE. PLEASE. THANK YOU.” She was just like, “Ugghhhhh. It’s too complicated. Why do you want to go there anyway? Can’t you just come back tomorrow? It’s too many buses. I don’t want to sell you these tickets.” All this was very surprising because I had, for the most part, found Chinese people to be ridiculously accommodating, like, keep-the-hotel-bar-open-till-6-in-the-morning-for-crazy-Irish-dancers accommodating or strangers-carrying-my-60lb-suitcase-up-the-stairs-at-the-train-station accommodating. In hind sight, she was kind of right, it was very complicated, but seriously, just give us the tickets. The journey consisted of two buses and then a tuk-tuk. I’m not sure if that’s actually what they’re called. They’re basically a cart with two benches and a tarp thrown over it pulled by a motorbike. The tuk-tuk driver informed us that the village we were trying to go was at the top of the mountain, not the bottom as we had originally thought (following some misleading advice from Lonely Planet) and would be another hour and a half. He said he could take us to another, closer town that night and we could sort out the mountain business tomorrow. We agreed that was the best idea. He took us to a village called Mashan and to a guest house he knew of. As we pulled up Eamonn said, “Wait….is that…a white guy sweeping that sidewalk?” When we stopped we realized it was indeed a white man, and there were two young Chinese women who spoke really good English. We discovered we were at the You family’s guest house. They had two daughters, Summer and MeiMei. They were both married to Americans. Summer and Casey (the white man we had seen sweeping) had been married for 4 years and lived in Oregon but had just had their wedding party in Mashan that very day. In fact, it had just ended and fireworks were still randomly going off across the street. We felt a little awkward staying there on such an occasion but they assured us that it was fine and since we were Americans we were like family. We sat and chatted with Casey while they got the room ready. A neighbor came over to join us. He was the local doctor, the best friend of Mr. You and, incidentally, very, very drunk. He proceeded to tell us that America was #1 over and over and over and over and over. We noticed there was an older woman patiently waiting behnd us. Finally, she summoned Summer who interupted us saying that she needed the doctor immediately because, get this, this woman’s husband had FALLEN OUT OF A MOVING CAR and needed help badly. But he kept going and we were like, we get it! We are number one! We have the dialing code to prove it! Now please, please help this woman! We went to the local barbeque stand in town with Summer and Casey for dinner. 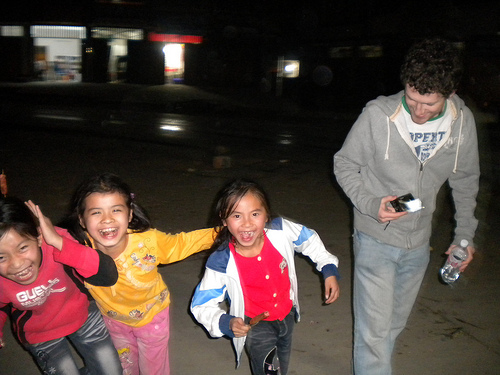 It was pretty busy and there where loads of kids from the town who were daring each other to come up to us. The next day they suggested we visit a local cave. It was interesting and beautiful but I was really anxious to get outside. We started to walk the few miles back because it was a gorgeous day. We were surrounded by rice paddies. We realized that we were burning daylight, though, so we tried our hand at hitchhiking. It didn’t take long before we were picked up by a large truck. Somehow I ended up the only one without a seat, forced to kneel on a shoe, some pop cans and other assorted garbage with my face two inches from the windshield. Luckily, it was only moments later that we were in Mashan. 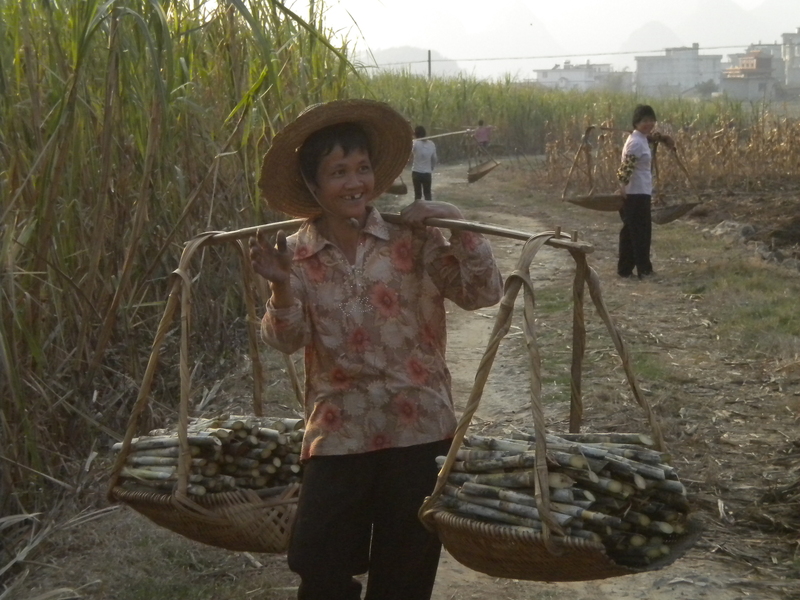 We decided to stroll through the sugar cane fields just outside of the village. Back at the You’s, they were preparing a dinner for all the people that helped with the wedding. They invited us to eat with them before we left. It was quite a spread and a wonderful way to end our stay. We had to ship off pretty quickly, though, as it was getting late and we had to get back to Nanning that night. We attempted to hitchhike to no avail. We then took a tuk-tuk to the next town and ended up hiring a taxi to take us back out of sheer desperation. We were kind of bummed that our adventure ended in an air conditioned mini-van but we also needed to be responsible. I’m really glad we seized the opportunity to get out of town. When in another country, I usually prefer spending time in the countryside to cities. The only down-side it that it gave me a hankering for a real back-packing adventure. Unfortunately, I haven’t yet found a way to get paid to vacation. I’m going to have to work on that. We were supposed to have four days off in Beijing but we had an extra gig booked in a town in the south, about 90 miles from the Vietnam border, called Nanning. 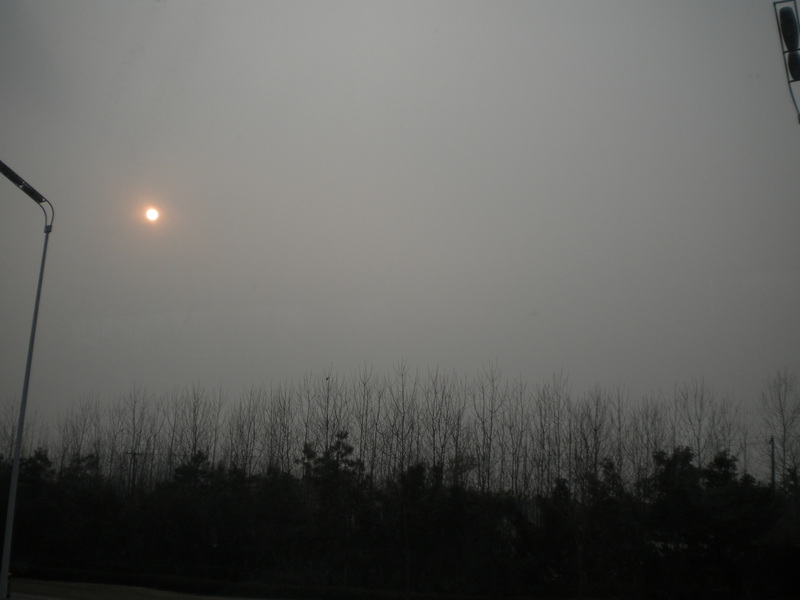 The first thing we noticed upon landing in Nanning was that we saw pure, unadulterated sunshine. Sunshine that was actually warm on our skin and hurt our eyes when we looked directly into it. It was glorious. Though I was thoroughly exhausted when we got in, I couldn’t sleep because I just wanted to be out in the sunshine. The first night nearly the whole cast went to dinner at what could be best described as a Chinese food court. It was in a warehouse type building with food stalls, shops and dozens of tables. It didn’t take long before we started making friends. 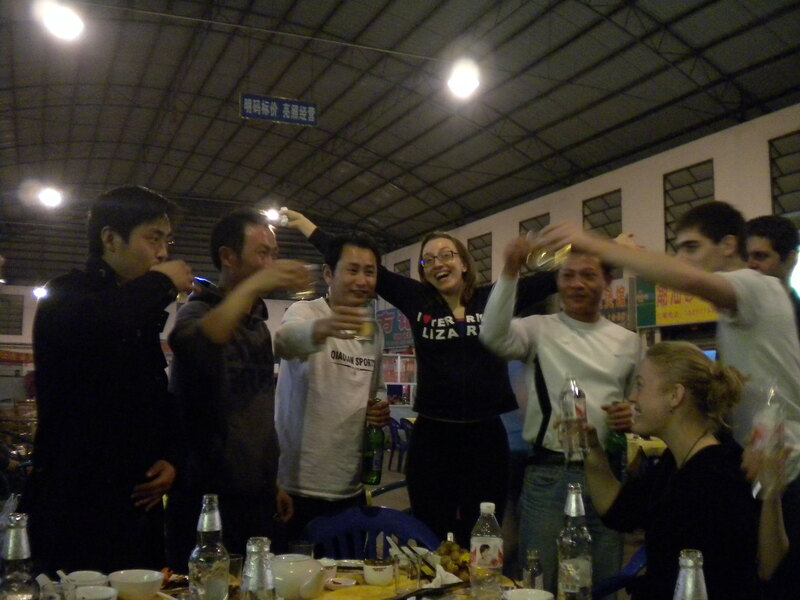 First, there was a group of men who were traveling together who had actually seen us in Chongqing. They approached us, and through our priceless interpreter, Lindsey, asked if we were indeed the cast of Celtic Legends. I mean, what are the frigging odds?? Then more friends were made when a few of the lads decided to buy rounds of beer for entire tables of people. There are a few things you need to know about Chinese beer for this story. First, it is very cheap. The beers here were 10 yuan for a 32 oz bottle, that’s about $1.40. It is also very weak, typically around 3% alcohol. There is a toast in China called “gambe” and when you gambe, you finish your whole beer. Luckily, you’re usually pouring the beer into a much smaller cup while you’re drinking so you’re not asked to gambe 32 ounces of beer, that would be ridiculous. Luckily for me, I was excused from the endless, “Gambe!”s. I explained to them that I was a delicate flower of a young(ish) lady and that they wouldn’t want to see what happened to me if I were forced to go gambe to gambe with them. I really enjoyed our time in Nanning. We had a wonderful few days off in 80 degree heat and endless sunshine. A few of us were able to escape to the countryside, which I will chronicle later. We also had the best audience of the tour there. Chinese audiences are different than I’m used to. They’re just not…enthusiastic. At first I was a little put off, but the more I spoke to people about it, the more I realized it was just a cultural thing. I heard the same complaint from the Riverdancers who were touring there. And my friend, Jason Fetz, who is teaching English in Changchun said that when he produced a play at his school the audience was often louder than what was happening on stage. Usually, if I’m singing on stage and I hear someone start talking (by the way, people, we CAN hear that) or chomping on some potato chips, I throw glance in their direction in an effort to make them feel mildly embarrassed. But with some of the Chinese audiences I couldn’t keep track of all the conversations. Oh my god, is that not the nicest thing that someone could say to you? So we left Nanning with a warm feeling in our hearts to carry us to the cold of Beijing. What Did I Ever Do To You, Hefei? Hefei is in the Anhui province of China and looks kind of like Troy, MI or Schaumberg, IL. It’s a sea of nondescript office and apartment buildings. From a distance, such as from my hotel window, the only things distinguishing it are the Chinese characters on the buildings and the ever present pollution, which people kept reassuring us is “just fog” (I’m sorry, People of China, I’ve been in San Francisco when the fog rolls in and it is not brown and it does not burn my eyes and lungs). I’m sure there are people who could prove me wrong on this but I didn’t find much to do or see in Hefei, and I think that’s just what I needed. We were traveling every 3 or 4 days and it was getting quite exhausting. I’d been good about getting up early and exploring but it was nice to have a few days to relax. One thing I enjoyed about our time there was that, for the first time, everyone hung out together, cast and crew, in the hotel. I was traveling with a great group and it was nice to have everyone in the same place for a night. It was too much fun. The night started with drinking games (do Irish dancers really need drinking games to consume a plentiful amount of alcohol??) and ended with me in a chicken fight in the hallway, which I realize is an activity traditionally done over water to soften any falls but such was my reason at that point. As I said, I didn’t see much of Hefei, but I learned a lot about myself from the people there. Namely, that I look terribly fat on stage, that my chi is out of whack, and that being a singer is not nearly as interesting as being an Irish dancer. After the first show, the music director, Liz, pulled me off the bus because someone wanted to meet me. It was a young woman with a camera and I thought, “Great! I have a fan in China!” But as soon as she saw me she said, “Nononononononono. Seenger. Seenger.” We tried to convince her I was the singer but she wouldn’t believe us. Lindsay came to the rescue to translate and explain that I was, indeed, the singer. She was translating my one fan in China in real time and said, “She didn’t think you were the singer because….oh….I’m not translating that.” I insisted that she did and she said, “Well, she thought you were much fatter on stage.” Mind you, I was wearing a DOWN COAT during this exchange giving me plenty of extra inches. The cast was supportive at first. But soon after the fat jokes were flying and I procured a new nickname: “Fatty”. It’s ok. I don’t actually think I’m fat. Though I do think it’s a little odd that, to my one fan in China at least, I look so much heavier on stage that in real life I am unrecognizable. So I have to get cupped pronto. I can’t very well be walking around with my chi out of whack. Later that day we were at the theater before the show and a couple of camera crews showed up wanting to interview members of the cast. After talking to some of the dancers, they came into my dressing room. The first thing they wanted to film was me putting my feet in this foot warmer box thingy. The day before some people who worked for the theater asked if they could photograph me doing the same thing for a brochure. They really love this foot warmer. So after I did that, one of the presenters said, “Show us your…” and then proceeded to stamp her feet around. I said, “Oh, actually, I’m the singer!” To which she replied, with a crest fallen face, “Oh…” and then promptly turned and left with the cameramen following behind her. So, Hefei, thanks for the memories. I don’t think I will be back anytime soon. Namely because I didn’t find you very interesting but mostly because you made me feel really, really bad about myself.